After a late start related to last nights alcohol abuse we stroll through Malicorne in order to do our shopping before the imminent weekend lock down. 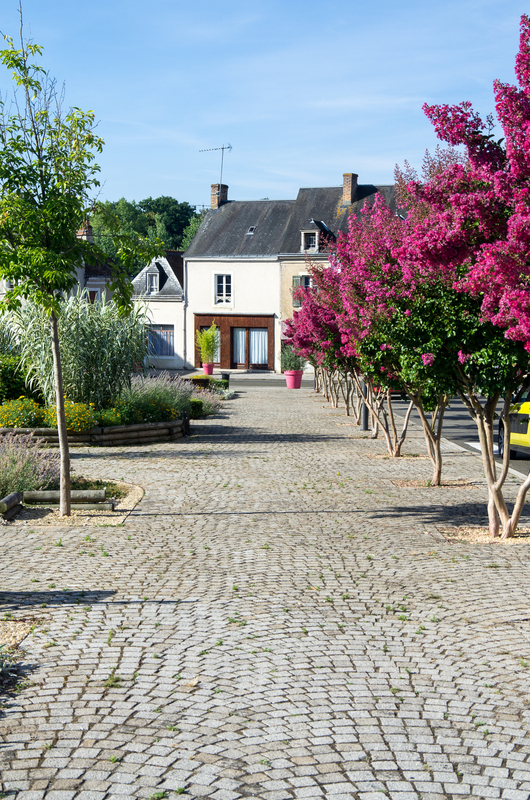 Malicorne is the quintessential French small town far away from Paris, and in fact anything else. Even so the square displays some civic pride. We bid farewell and steam upriver, as we are on mission today. The child has be collecting every single leaflet advertising a zoo in every single tourist information. The only zoo that is even vaguely near our route is located in Spay, just a few miles short of Le Mans. Talking to the eclusier at Spay lock she tells us that she will phone the zoo director as she is a friend of here and we will get a discount. 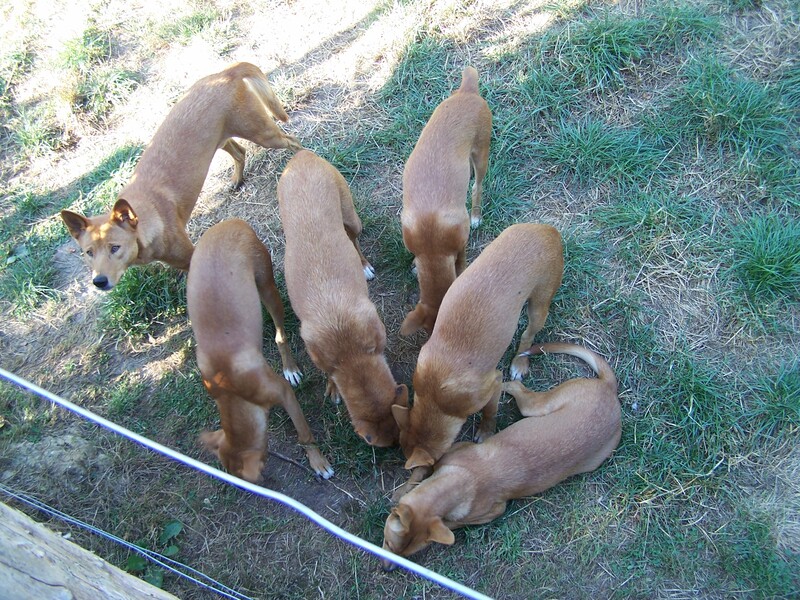 So we set of through the scorching lunch time sun to walk the 5 km to Spaycific Zoo. And it is really worth the effort. Its quiet different from any zoo I have been so far. Although you could say its a bit provincial, its totally unique in the selection of animals they display. From Dingos, huge tortoise, spiders and snakes there is all kind of stuff. The highlights really are the “enclos d’immersion”, enclosure you can actually enter. So you not only watch the animals through a fence, but can move between them. Particularly are the enclosures with bats and the ones with the Wallabies. The child loves the Dingos. When we arrive at the zoo we are immediately recognised as the “boat people”. And we get the offer the be chauffeured back to the boat once we have finished our visit. So we are spending a really unique afternoon in this treasure trove of a zoo. We buy a cuddly toy hand puppet, for the lock keepers child from yesterday. The the zoo director himself drives us back to the boat. So if you get even vaguely near Le Mans have an outing to Spaycific Zoo. 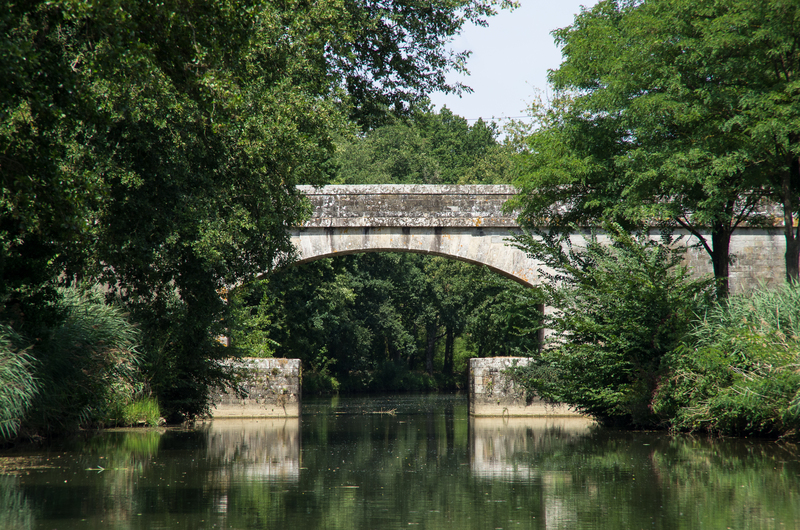 From our makeshift mooring next to a bridge on the lateral canal above Spay lock we turn round and sail a short stretch downriver to the village of Fillé. Here we again meet the Israel naval detachment and later a boat from Switzerland arrives. So we have another nice evening killing a few bottles of red. Pincé is only the tiniest of villages. No boulangerie, and not much else in fact. 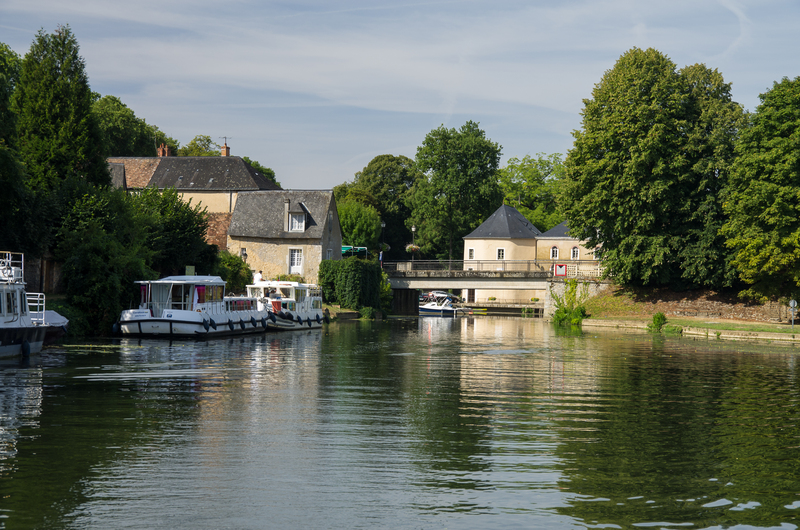 So we head of the find bread in Sablé-sur Sarthe. 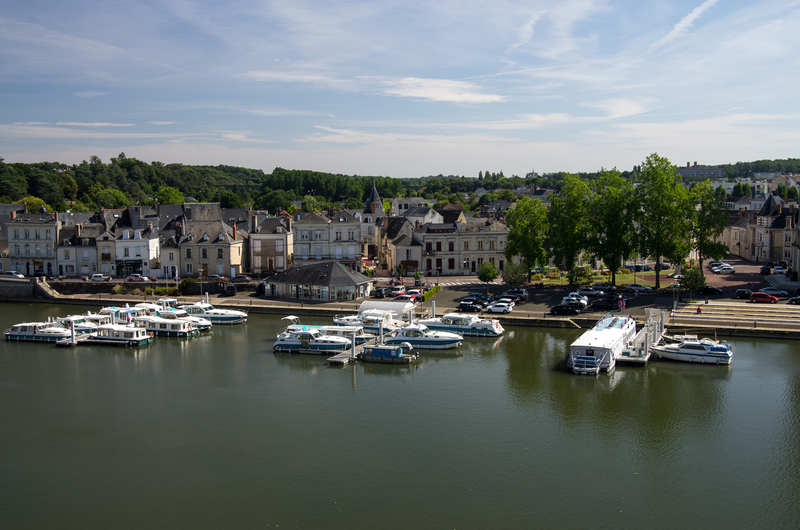 Sable is the biggest town between Anger and LeMans. Its château has a varied history. After being a factory for chicory cafe for a while, it houses part of the French National Library today. We ask at the hire boat base if it was in order to moor up on the jetty and the could not have been more welcoming. We duly venture up the hill for the views and to visit the castle gardens. So we can present another picture of ARGO taken from the walls of a castle. After that it is shopping on the outdoor market on the square. The butchers wife convinces us to buy some Rillettes des Sable, a pate made from geese. It gets our staple diet for the next few days. Fresh bread, rillettes, salt and peper and a glass of red. Yummy. 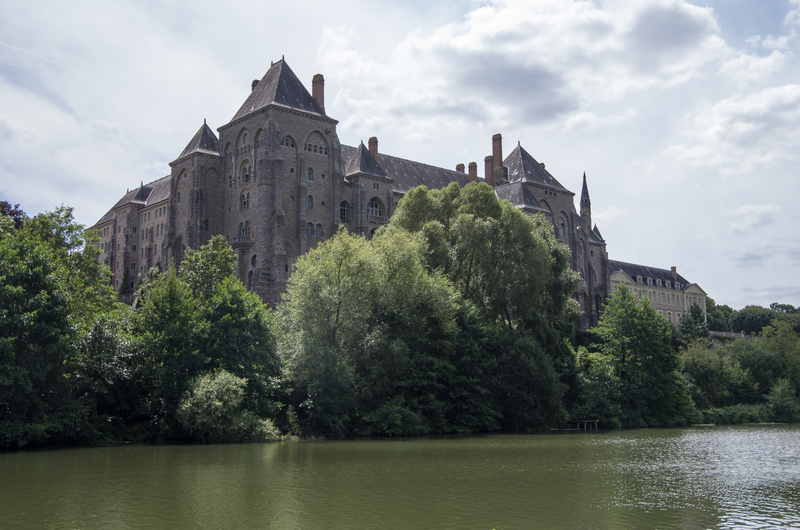 A mile up the river there is the village of Solesmes, overshadowed by the monstrosity of its abbey. Apparently still 100 monks live there today. But for me as an atheist the building alone is so forbidding, that I have no interest in visiting it. At ecluse 9 Malicorne I ask the eclusier if he can point me to the filling station that I have marked on my map in preparation for this trip. Grand malheur, the filling station is closed for holidays. The next one is 10 km away, but no arguing, he will drive me there. I grab the jerry cans and we bump over the smallest of French country roads to a backyard pump in the middle of nowhere. He refuses to take any payment or a beer, so we have to come up with a plan to reimburse him on our way downriver. 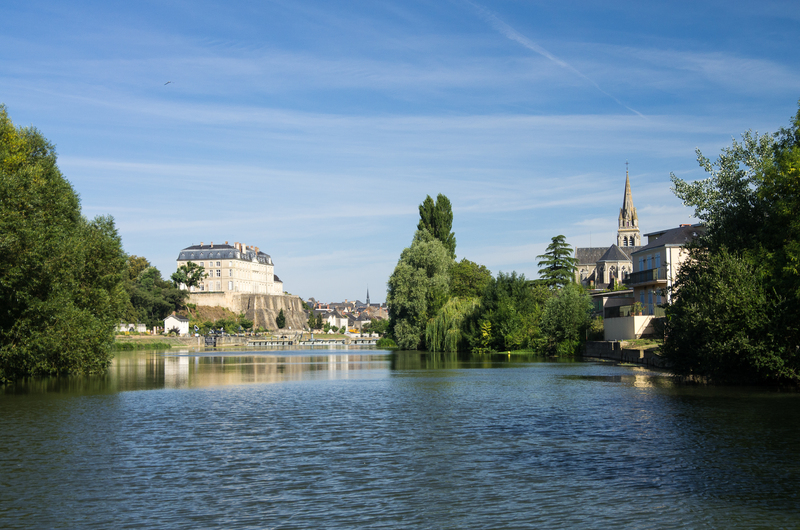 As Malicorne-sur-Sarthe seems to be such a nice place, we decide to stay here for the night. We moor next to a Penichette with two German couples and a bit of a impromptu banter is organised. Just at nightfall the Israelis with there huge Penichette appear through he lock. A not so sober any more boat shuffle takes place to accommodate the Israelis. A big hallo to all sides, more wine and nibbles are organised and it gets very late.